Quinn, a former city council speaker and one-time mayoral candidate, said she was "simply and utterly devastated"
The man who was arrested for scrawling anti-Semitic graffiti inside a Brooklyn synagogue was an intern for former city council speaker and one-time mayoral candidate Christine Quinn for several years. 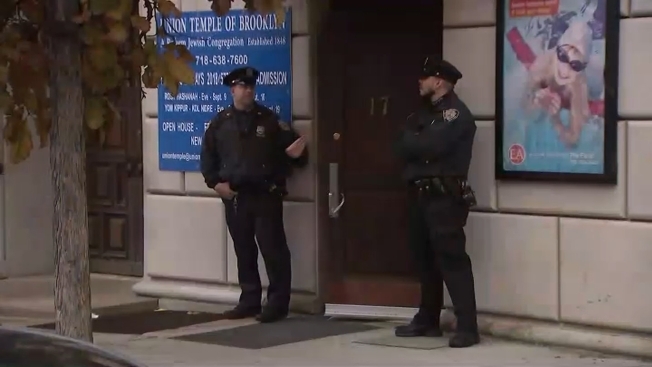 James Polite, 26, was arrested on Friday after hate-filled messages were discovered at the Union Temple in Prospect Heights. A spokesperson for Women in Need, the homeless services provider of which Quinn is now president and CEO, confirmed on Saturday that Polite was the former Quinn intern profiled in the New York Times last year. During his time as Quinn’s intern, he worked “on initiatives to combat hate crime, sexual assault and domestic violence,” the Times reported. Polite, who met Quinn at a gay pride rally for Barack Obama, “spent much of his childhood in foster care,” struggled with a drug problem and was diagnosed with bipolar disorder when he was in a rehabilitation program after taking a leave of absence from college in 2015, according to the Times. “I know this young man, and along with many others in the New York City Council and social services agencies throughout the City, have done everything I could over the years to help him as he grew up in and out of the foster system, in and out of the mental health system, and in and out of homelessness,” she wrote. “I stand with the Jewish community today and every day, and pray for all New Yorkers who deserve the very basic right to enter their place of worship without fearing for their lives,” she added. In addition to scrawling graffiti inside the synagogue, Polite allegedly lit several fires in the area, including one at another synagogue, law enforcement sources said. After the graffiti was discovered, the synagogue canceled a political event hosted by “Broad City” star Ilana Glazer.